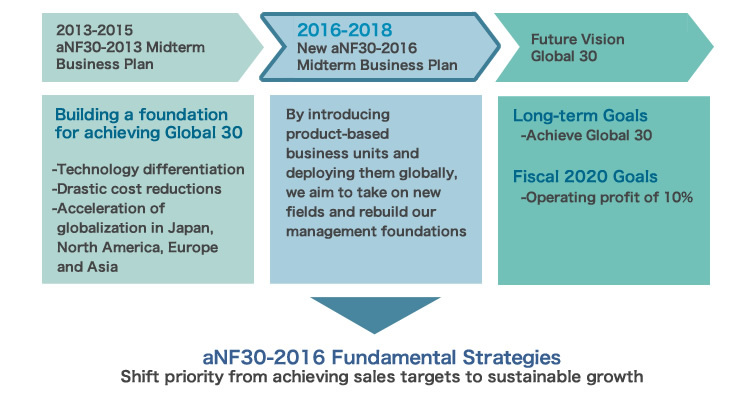 Midterm Business Plan | Management Policy | Investor Relations | Akebono Brake Industry Co., Ltd.
Progress of Midterm Business Plan "akebono New Frontier 30 - 2016"
The midterm business plan, "akebono New Frontier 30 - 2016 (aNF30-2016)," ending in fiscal 2018, contains the goals of 1) rebuilding North American operations, 2) establishing global networks based on product-based business units, and 3) expanding high performance brake business and recreating European operations. 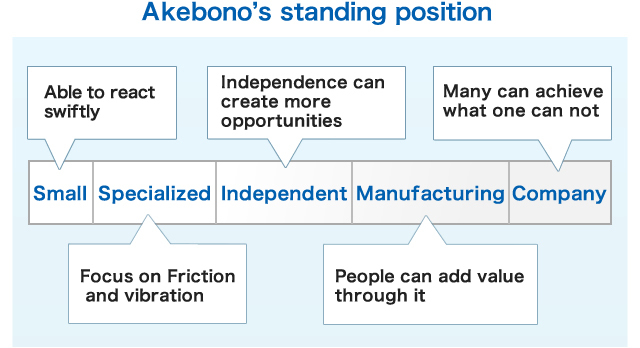 By realizing these goals, Akebono plans to achieve a sound financial condition and facilitate sustainable growth. Although we produced some positive results in fiscal 2017, the second year of the plan, new challenges have emerged. The Company will unite to solve these challenges and achieve these goals. As a result of taking measures to rebuild North American operations, in fiscal 2017, operating profit improved by about JPY4.8 billion to JPY1.5 billion, returning to profitability. 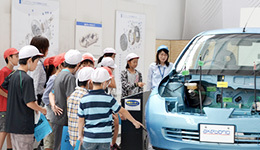 Despite achieving positive results, such as restoring profitability, sales are expected to decline for several years due to the withdrawal from sedan model by a customer and losing business opportunities for subsequent models because of production problems. Nevertheless, we will continue our efforts to optimize the production system. Challenges caused by the implementation of major reforms led by U.S. management have also emerged, and therefore I believe we have entered a reform phase that cannot be dealt with by local management alone. To achieve growth, we will go back to the basics of a being manufacturing company based on Japanese Monozukuri (manufacturing excellence), further strengthening cooperation between Japan and the United States. We work to further improve North American operations. While improving each product's profitability, we have launched five business units (BUs) responsible for marketing, product development, production and sales in various fields with the aim of strengthening our global competitiveness. Although the transition to the BU structure is still in progress, we are taking various measures aimed at completing the transition by the end of fiscal 2018 as originally planned. The current major challenges include promoting efficient collaboration between BUs and headquarter functions, as well as BUs and overseas operations, but we will work on these to achieve the midterm business plan. 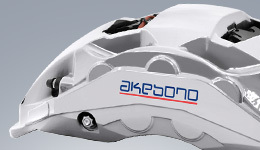 The expansion of the high performance brake (high performance brakes for mass-produced vehicles) business is proceeding smoothly and in line with plans. 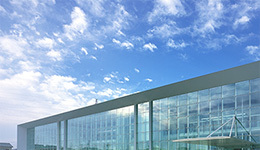 Full-scale production at the Slovakia Plant began in 2016, and the transfer of the production of high performance brake products from the Columbia Plant in the United States was largely completed in 2017. 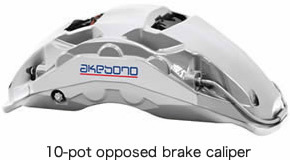 The high performance brake business plans to begin to expand globally including Europe, as well as North America and Japan. 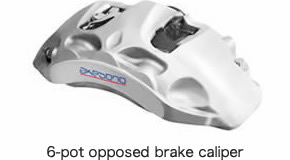 Realize both high performance and high quality by combining high performance brake technologies accumulated through F1 activity, superior NVH knowhow and cutting-edge manufacturing technology. Sales Strategy Expand sales especially in Europe with high performance technologies gained through brake development for premium German automakers. 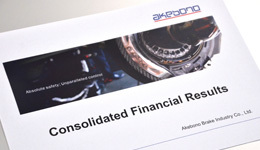 Akebono plans to return to a sound financial condition by steadily implementing the three pillars of aNF30- 2016, namely 1) rebuilding North American operations, 2) establishing global networks based on product-based business units, and 3) expanding high performance brake business and recreating European operations. In fiscal 2017, the second year of aNF30-2016, Akebono made progress in line with the plan, achieving its capital investment target of JPY11.6 billion. The SG&A ratio for domestic operations was 14.4% in fiscal 2017, compared with 14.0% in the previous fiscal year, against the 12% target. In addition, Akebono spent JPY10.3 billion on development. 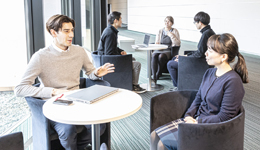 The Company intends to invest JPY10.0 billion annually on development, while shifting the allocation of funds from application development to focus on advanced research and development. 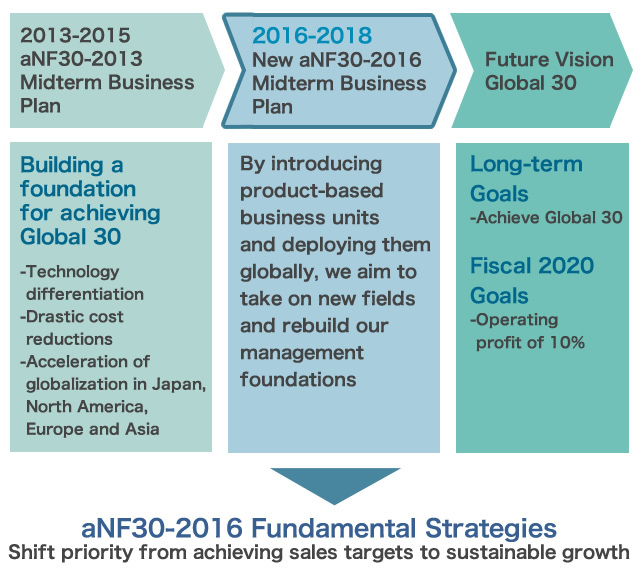 In fiscal 2018, the final year of aNF 30-2016, Akebono will accelerate measures with the aim of achieving the targets of the midterm business plan as early as possible. Details of the new business plan are shown in the accompanying presentation.